I’ve recently fallen back in love with this shawl and have been wearing it everywhere the past couple days. It’s large and cushy without being heavy or dense. It’s super easy to wear, and looks great with just about anything. 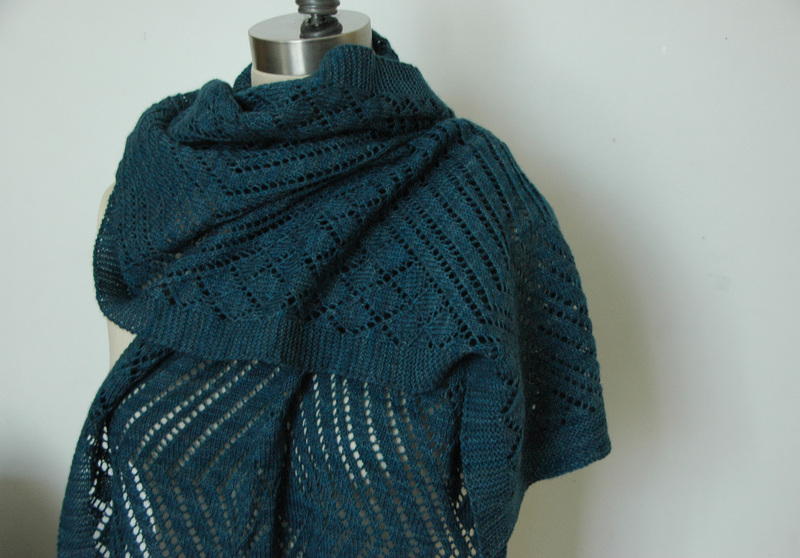 I originally designed this shawl for the Sanguine Gryphon’s Fall 2011 “Film Noir” pattern line. The original sample was knit with two skeins of Mithril (which the Verdant Gryphon now carries) in the “Der Blaue Engel” colorway. I’ve since re-released the pattern, which you can get here. The craziest thing about this shawl is how much I LOVE it now, compared to how over it I was when the pattern first came out. Since I tend to design very large, intricate shawls that can’t generally be whipped up in a couple days, I try to be very conscious of deadlines and how much I’m knitting when I’m knitting on a deadline for a publication. Usually I work out how many days between when I get the yarn and when I need to mail off the sample, then I determine the number of rows I need to knit every day between now and then to get the sample done with plenty of time to block it and mail it, and make sure it gets to the publication on time. Usually I try to build in plenty of cushion into this schedule because I’ve found that, just like I don’t really knit small shawls, I don’t really make small mistakes either, and the larger the shawl the larger the mistake. Somehow this didn’t whole planning thing didn’t happen for Gene Tierney. I don’t remember why this process didn’t happen. Maybe it’s because it was summer, or I had a lot of other work at the time (theater and knitwear), or because I knew I was going on vacation for a week so I’d have lots of knitting time, or I just got distracted because I knew it was a rectangle so I didn’t have to front load so much of the knitting like I do with shawls where the stitch count increases. But for whatever reason it didn’t happen. 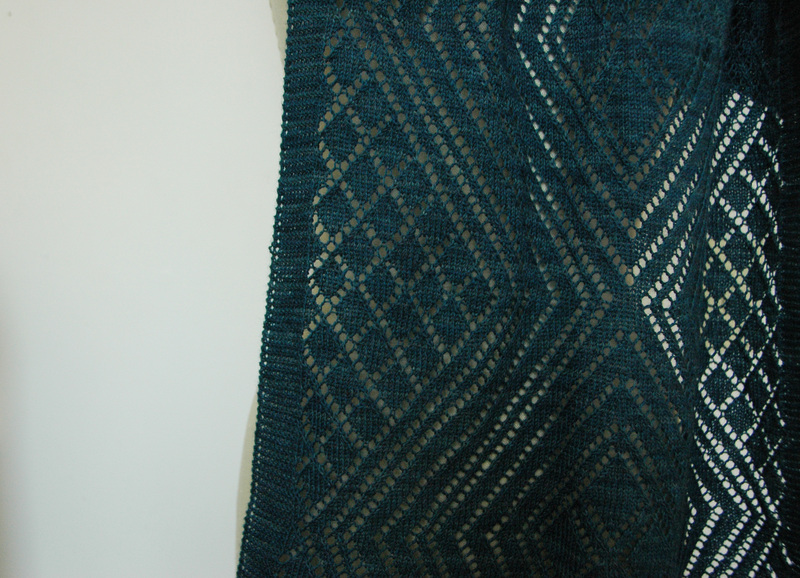 The shawl was due in something like two weeks, and I hadn’t exactly been power knitting through the sample. I think I had maybe one repeat done (out of six). So I flipped. And then finished knitting the shawl in seven or eight days. Not something I can highly recommend. 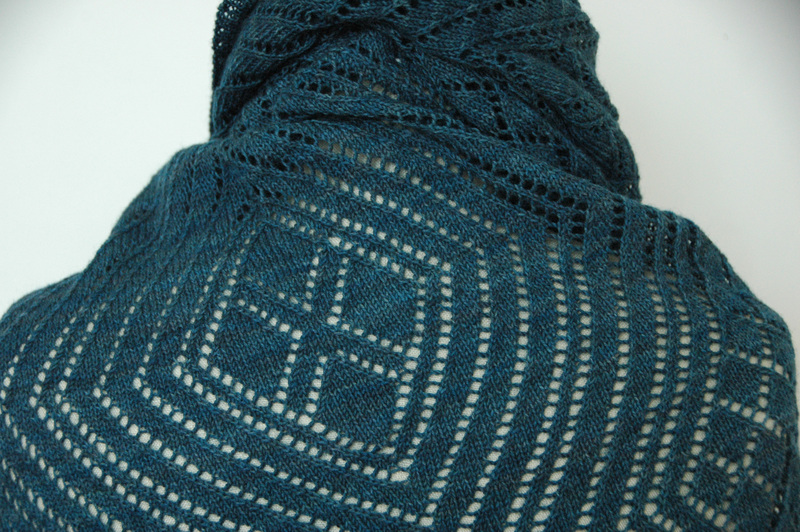 I blocked the shawl, wrote the pattern, sent the shawl off asap and just made the deadline. At which point, even though I loved the pattern, and the yarn, and the design, I was a little over it. So, I eventually got the sample back, put it in a drawer, and didn’t look at it for awhile. Re-released the pattern, but then put it back in the drawer. Only to pull it out one day this spring and fall in love all over again. You can find the details for the pattern here.